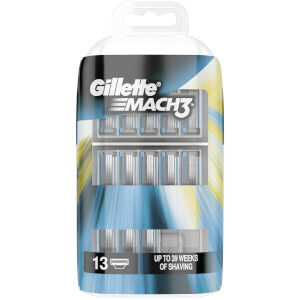 Gillette Mach3 men’s razor blade refills feature stronger-than steel blades that stay sharper longer (vs. Sensor3). With sharper blades (first 2 blades vs. Sensor3), it is engineered to last for 15 comfortable shaves. These Gillette razors feature a lubrication strip that glides to help protect your skin from redness, and a microfin skin guard that stretches the skin, and prepares hair to be cut. Mach3 men's razor blade refills fit all Mach3 razors. PEG-115M, PEG-7M, PEG-100, Silica, Pentaerythrityl Tetra-Di-T-Butyl Hydroxyhydrocinnamate, Tris(Di-T-Butyl)Phosphite, BHT, Glycol.